The Bed frame is designed to lift your spirits. In one neat package, it helps you frame the world around you. It is solidly built to last for generations. The all-welded grills arch upwards in graceful swirls and curves, completing the 1 top rail. The distinctive shape on the center spindle casting draws your eye to the heart of the bed. Tall, 1 one-piece posts, showcase beautiful cast finials on top. Best of all, the bed frame hosts a simple linear canopy. It's the perfect place to drape billowing fabric to soften the architectural lines. Matte Black finish - midnight black sheaths the bed in a modern coat of armor. 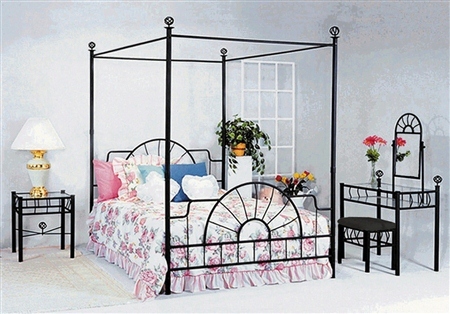 This one-step, powder coat finish is durable and completely maintenance-free.The Bed frame features an exciting scroll design and canopy. The textured black finish makes this a great transitional piece for any home. Fully-welded construction featuring heavy gauge tubing. Constructed of sturdy metal, this piece features classic ball finials atop elegant straight posts anchoring the straight main panels which are accented with delicately looping spindles.